Essay topic: Clearly, The Strange Case of Dr Jekyll and Mr Hyde is an examination of the duality of human nature. Discuss. See Appendix 1 below for task sheet. 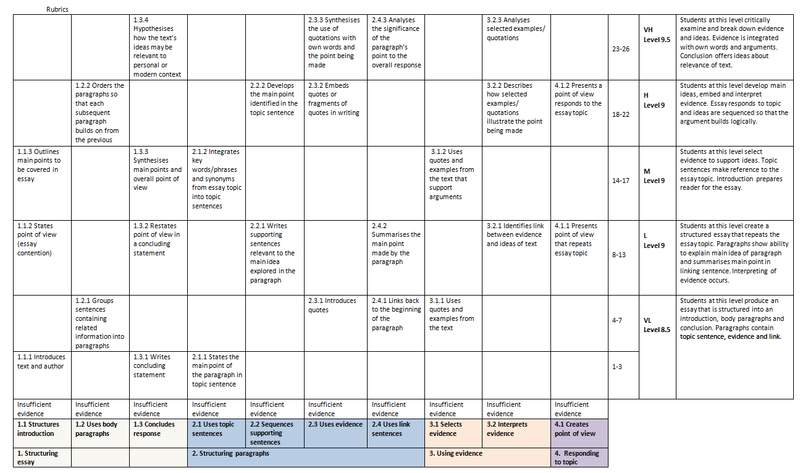 This developmental assessment framework was drawn from the Australian Curriculum English Scope and Sequence (ACARA, 2012). The sub-domains are from the Modes of skill and/or knowledge detailed in the scope and sequence. 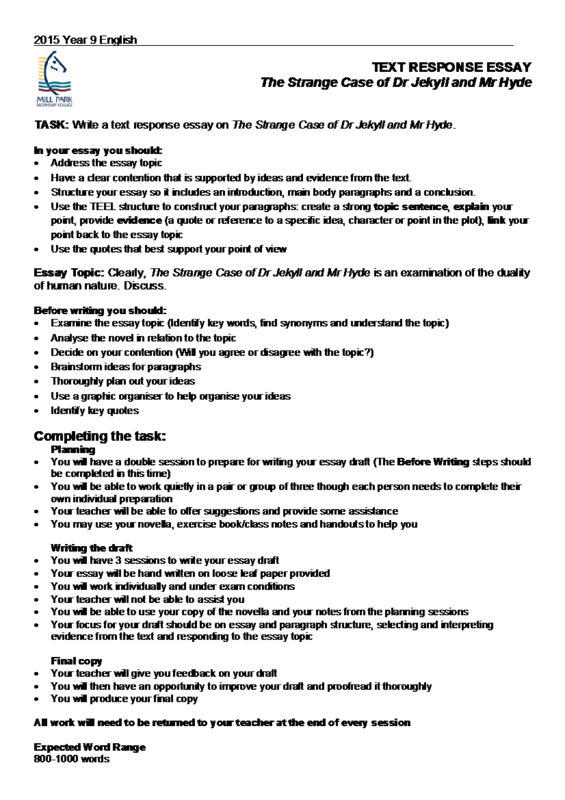 The Sub-Strand Focus from the curriculum was used for the strand and the capabilities are drawn directly from the Achievement Standards for Level 9. 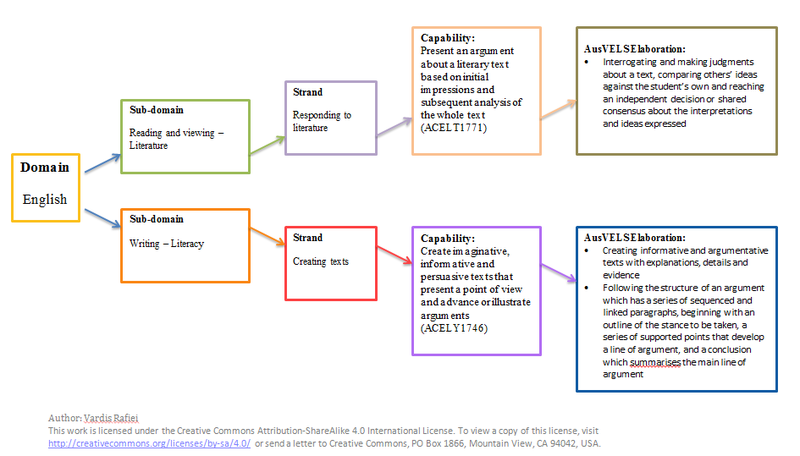 The AusVELS Elaborations come from the AusVELS English Curriculum (VCAA, 2013) and show a link between the two frameworks while also giving more detail about the capabilities. Administer: How will the assessment be administered? What measures will ensure accuracy of the evidence? Record: What records will be kept from the assessment? Interpret: How will the assessment evidence be interpreted? Use: How will the assessment and its interpretation be used? Outstanding Relational Essay presents a complex contention that responds to the essay topic. Relevant evidence is selected and discussed both for how it is consistent with their contention and inconsistent. Evidence is embedded in the writing. TEEL structure is manipulated to suit the writer’s needs. High Multistructural Essay presents a contention that responds to the essay topic. Relevant evidence is selected from the text and used to draw conclusions. Evidence is introduced. TEEL structure used comfortably. Ideas are clearly communicated. Medium Unistructural Essay presents a contention that responds to the essay topic. Relevant evidence is selected from the text and included in essay. TEEL structure is used. Low Prestructural Essay expresses a point of view that repeats the essay topic. Evidence is included in essay. Like-ideas are grouped in paragraphs.